If you’re anything like me, you’ll never leave the house without your smartphone and you’re excited to wear the latest technology – particularly if there’s a fashion forward way to style it. This is where our favorite designers come in. Of course, you’ve heard of FitBit wrist bands and even its necklace counterparts – all designed to track your health while giving you basic alerts from your phone. But wearing one of those gadgets shouldn’t mean having to lose your individual flair. If you’re a techie by nature but a fashionista at heart, here are fashionable ways to wear your tech gear in definitely trend-worthy ways. 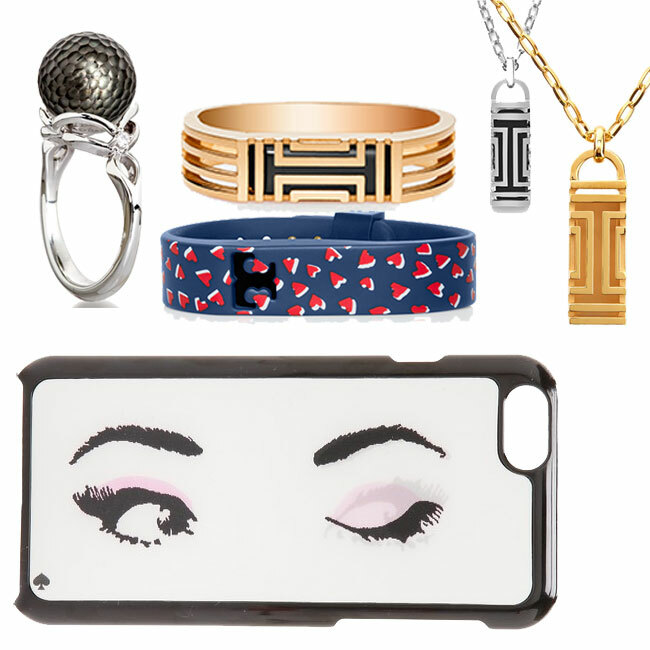 Stay fashionable with your favorite tech gear in tow with these special pieces of jewelry. Above: (Clock wise, from left to right) The Momento Pearl Ring allows you to store and share photos and voice messages, and then viewing them via NFC technology by just tapping on your smart phone – like a locket for the techie generation; Tory Burch FitBit wrist band covers in rose gold and blue with red heart print; Tory Burch FitBit necklaces in silver and gold; Kate Spade Lenticular iPhone case.